The Oakworks Essential Massage Table Accessory Package includes the Essential Carry Case, an Oakworks Quicklock Face Rest Platform with Aero-Cel Face Rest Crescent and a 6" Semi-round Bolster. This portable massage table package is great for someone just getting started or the seasoned massage therapy professional looking to expand their business. This package is designed to fit portable massage tables up to 31 inches wide with semi-firm firm or plush padding. Not available for 31" tables with AeroCel padding. Oakworks Essential Carry Case - This carry case is constructed for a rugged polyester material and features a front pocket with zipper, 1 Handle - front, low, 1 Handle - back, high - with D-rings, a sturdy Shoulder Strap and a zipper closure. Aero-Cel Face Rest Crescent - This face rest pad features soft and supportive AeroCel padding. This face rest pad is adjustable to support a variety of face sizes and is designed for use for prone or supine positioning. 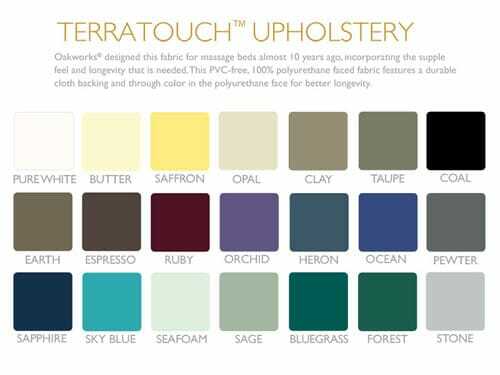 The AeroCel Face Rest pad is available in any of our PVC Free TerraTouch fabric colors. 6" Semi-round Bolster - The Oakworks 6 inch semi-round bolster features pull handle at both ends, a Zipper closure and is available in any of our PVC Free TerraTouch fabric colors. ► Dimensions: 36in. x 29in. x 10in. View accessories included in our catalog.